Pickleweed is a member of the Goosefoot Family. It appears as a low, highly branching shrub and with each branch consisting of fleshy, cylindrical segments. These succulent stems conceal the tiny leaves and flowers of the plant which are hidden in the joints. 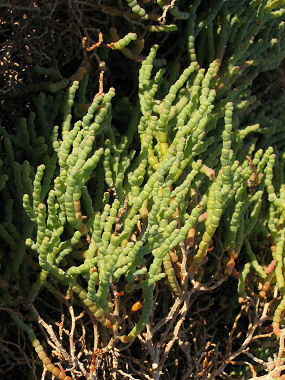 Pickleweed can grow in a soil salinity of up to 6%, though is typically found in salt playa areas with approximately 2.4% salt. Pickleweed is a salt loving plant and typically grows in areas of high salinity like salt marshes or salt flats in areas with a continuous water source, often where no other plant can survive. The secret to the plant's high salt tolerance is found within its cells. First some salt is filtered out at the roots of the plant by tiny sodium-potassium pumps within the cell membrane. Other cells within the plant pump excess salt to storage cells (vacuoles) at the tips of the segments. When the vacuole can not hold any more salt, the cell breaks down, turns red and falls off, leaving the younger cells to take over pumping and storing salt. 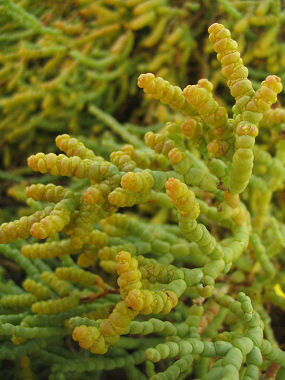 The plant gets its name from the facts that the fleshy stalks look vaguely pickle-like and that it tastes salty, like a pickle.